This page compares cellular data vs wifi data and mentions difference between cellular data and wifi data. Let us understand what the data refers to. Definition: The term data refers to electronic information that is transmitted/received from/to your mobile phone. All of the following activities fall under data. • Share photos/videos from your phone to the internet. • Send and receive E-mail messages. • Use social media sites like facebook, google plus, twitter etc. • Watch streaming video on a website using an app like youtube. • download apps from apple, microsoft or google store. • Follow directions as provided by maps app. 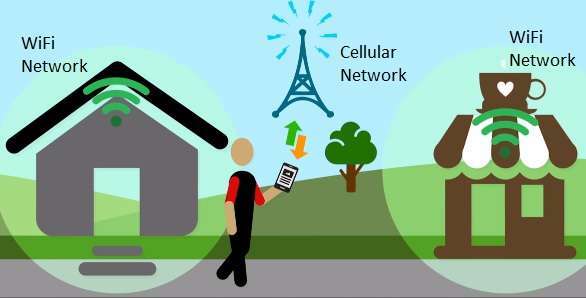 • The data transported over cellular network is known as cellular data. • There are different cellular network such as 2G (GSM), 3G (WCDMA), 3.5G (HSPA+), 4G (LTE, Mobile WiMAX), 4.5G (LTE Advanced) etc. in increasing order of data speed requirements. Refer Cellular tutorial for more information on cellular network basics. • Cellular network is available nation wide. • Cellular data users will be charged as per different subscription rates and usage. • Coverage range is higher. • The data transported over wifi network is known as WiFi Data. • The WiFi network follow various IEEE WLAN wireless standards such as 802.11a/11b/11g/11n/11ac/11ad etc. • WiFi network is not available everywhere but now-a-days it is available in business offices, malls, airports, railway stations etc. • WiFi data users are not charged and it is available free of cost at most of the public places. • Coverage range is lesser compare to cellular network. Refer mifi vs wifi which describes how both cellular data and wifi data are being used in the home with advanced mifi+wifi routers.